This weekend was the turning point for a project I've been working through lately. I've been trying to come up with a fall leaf garland and although I had the basic conceptual of it fairly early on some the "how to" was taking it's dear sweet time actualizing. It was the fabrics that were giving me the most trouble. They would define the mood and feel. Felt- a little cozy and comfy but definitely simple and a little kids- crafty. 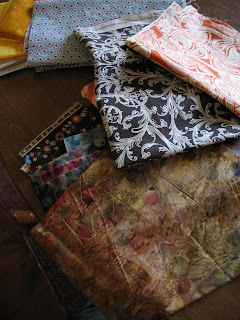 Seasonal Quilt fabric- ok but a little too much in my opinion. 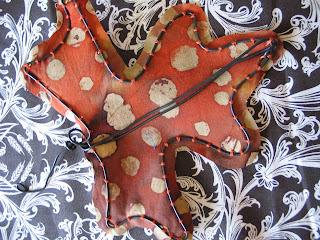 It screamed fall and as the shape will do that, so I thought the fabric didn't need to as well. I found a lovely scrolled ornate pattern I liked that would probably work and it came in both orange and brown but no red for the maple leaves. But then I found a scrap of batik I had and I love how the sun shines through this fabric. It would look beautiful hanging in front of a window, which is where I kind of visualized putting it. YAY! Problem solved! The basic leaf concept I came up last year as I was casting about for some fall decorations. I wanted leaves to hang from my chandelier over the dining room table. For V-day I hang a stitched and stuffed wire heart, for Christmas some ornaments I've made. It's my revolving seasonal display. Thinking about it some- I realized what a big inspiration the calendar can be. Creating your own handmade decor for the holidays and seasons can prompt you to play with color schemes and imagery you might never have tried before. I don't naturally turn to browns and yellows in my work. But I love working with them. I just don't think to. But for fall? I can't think of anything I like better than to be surrounded with the browns and oranges and deep reds and golden yellows that define the season. So think about it. How could you surround yourself with the loveliness of the season? Then let yourself be inspired! So Charming- the latest Somerset Home!! !